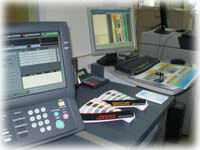 The newest technology on the market is digital printing. Our Digital Printer allows the richest, truest color next to offset printing. Digital printing is perfect for those quick turn around pieces for your meeting tomorrow! Our digital department delivers what you need, when you need it…On Demand. You get the quality, service and cost efficiency your company requires in one smooth operation.